The European Commission is likely to reject France’s 2015 budget draft at the end of October, and ask for a new one that would better reflect Paris’s deficit reduction obligations under European Union rules, several eurozone officials said. It would be the first time the EU executive exercises its power to demand changes to a national budget draft under new prerogatives that EU countries granted the Commission in 2013. The Commission is also likely advance the disciplinary procedure against France, to the final stage before fines, while at the same time granting Paris the extra two years it wants to bring down its budget shortfall within EU limits. The decisions, some of which will be taken by the outgoing Commission before a new team led by Jean-Claude Juncker takes office in November, would give France more time while upholding the credibility of the recently toughened EU budget rules, one eurozone official with insight into the process said. Such a solution would also help the designated commissioner in charge of policing budgets, French Socialist Pierre Moscovici, to prove he will not give preferential treatment to his own country, as many centre-right members of the European Parliament suspect. 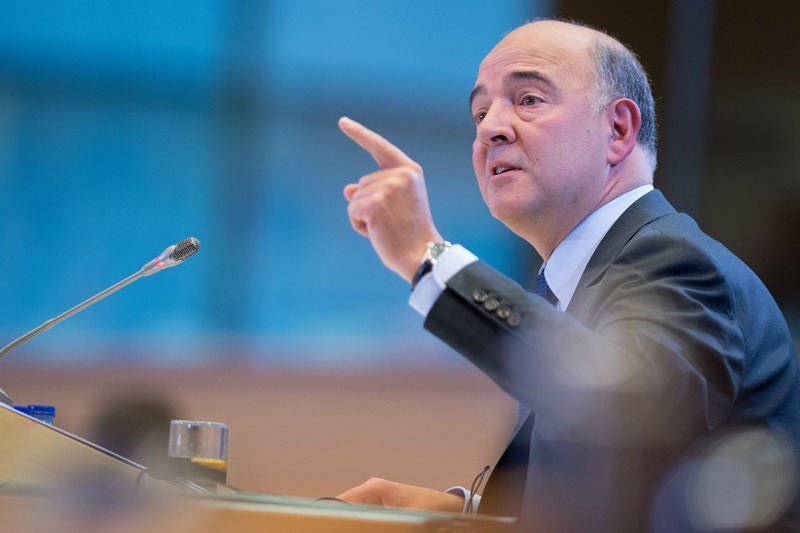 Moscovici was ordered to submit written replies by today (7 October) to detailed questions on how much flexibility he would give to countries that repeatedly breach EU fiscal rules after lawmakers found his answers at a hearing last week evasive. “It would save face for everybody,” the official said of the proposed Commission action. “Even if it would be a bit humiliating for France, they probably know they cannot get away without anything. “And it would also save face for Germany and the others, who are concerned about the longer-term effects, about not watering down the rules, but who also want to give France and its unpopular president a fighting chance,” the official said. Socialist President François Hollande’s approval rating is at an all-time low of 13% in some opinion polls due to public anger about unemployment, economic stagnation, public spending curbs and resistance to structural reforms. Germany, one of the strongest advocates of budget discipline in the euro zone, has been reticent in criticising France since the announcement that Paris would not honour its commitments. “It’s about the big political picture in France, in the end. That’s why Germany is so reticent. In Berlin they already have a strong picture where Marine Le Pen is the next French president,” the euro zone official said, referring to the leader of the extreme-right National Front who leads the field in some polls before the 2017 presidential election. “You don’t kick someone who is already down,” the official said, adding that the position would have been different had Hollande’s ratings been high. France was supposed to have brought its budget deficit below the EU ceiling of 3 percent of GDP last year, but in June 2013 EU finance ministers gave it a two-year extension, until 2015, because of a recession in the euro zone. On Sept. 10, Paris announced it would not meet the 2015 deadline either and the deficit would fall below 3 percent only in 2017. Last Wednesday, it published a 2015 budget draft that falls well short of the consolidation efforts sought by EU finance ministers in 2013. “To try and do more would be impossible not just for political reasons, not just because the social model would be completely done away with, not just because French people could not accept it, but because technically speaking it is simply not possible,” French Prime Minister Manuel Valls said. “To try and do more would not make it possible for us to try and boost growth, and make it impossible for recovery to happen,” he told lawmakers and bankers in London in a speech. While France blames weak economic growth, EU officials point out that it has not even met the goals to reduce its structural deficit – stripped of the effects of the business cycle – and so has not taken effective action to meet its obligations. EU officials said that a lack of structural reforms – freeing up markets, for example, or aligning pension systems to ageing populations – in France, Italy and even to some extent Germany, the countries that are the heart of the eurozone, are holding back growth for the whole of the common currency area. “The question is not about not knowing what to do. It is about getting it done. It is up to the political leadership of these countries to get it done. And EU budget rules do not prevent them from doing so,” a second eurozone official said. “Monetary or fiscal stimulus will not help if the reforms are not there. You can pour money into the system, but if the system is broken, it just doesn’t do the trick, it does not deliver anything,” the official said, betraying a frustration with the Paris government that is increasing in Brussels. France will officially submit that budget draft to the Commission for scrutiny on 15 October and the EU executive has two weeks to send it back for changes if it determines that the plan breaches earlier agreements. France was to cut its structural deficit by 0.8% of GDP in 2014 and the same in 2015. The budget draft however, foresees an improvement in the structural deficit of only 0.1 and 0.2% respectively. I find it pitiful how this stability or fiscal pact is being misused, not for bringing down deficit and debt, but, in exchange for this absurd constraint, any kind of “structural reform”. France is a very smart country so it should go ahead and promise some vague kind of “structural reform”, just like the Greeks did to the Troika with their “privatization program of 50 bio EUR” that has not even started being implemented after 4 years. It costs nothing to say one will liberalize pharmacies, notaries or taxies, nor does it generate any kind of substantial growth either. By doing so France would have in effect hollowed out that silly idea of a pact from Merkel and her conservative friends. This whole austerity thing had nothing to do with the wellbeing of the EU, but with Mrs Merkel’s little obsession of improving her approval ratings by humiliating her neighbours. The only reason why Germany is not openly criticizing France, but hiding behind the Commission or the Council, is hypocrisy , the only reason why France is not openly criticizing Germany is also hypocrisy. Nice article, thanks for the information. It’s very complete information. I will bookmark for next reference. I like yourr share information .. I like your sharing information ..